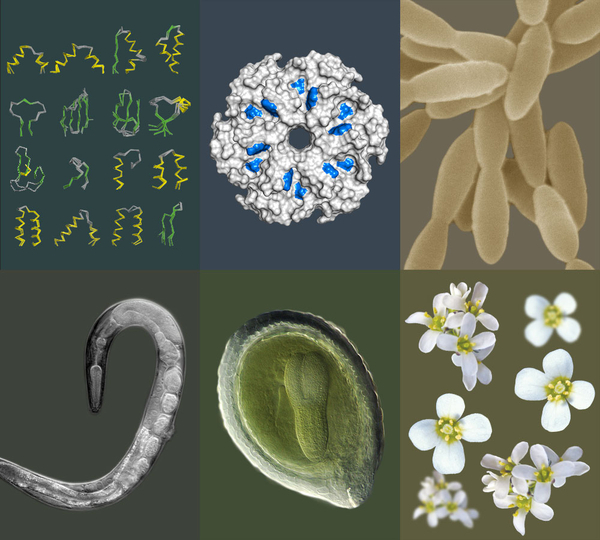 The variety of topics investigated by scientists at the MPI for Developmental Biology is extensive, although all subjects have a biological theme. The cutting-edge technology in molecular and cellular biology and computational science available at the institute is enabling scientists to gain increasing insight into cellular and developmental processes. A highly dynamic and interdisciplinary approach is applied from the molecular level to cells, tissues, and the whole organism. The core facilities of the MPI for Developmental Biology are the Electron Microscopy, Light Microscopy, NMR Spectroscopy, the Genome Center, and the X-Ray Crystallography. The facilities offer a broad range of methods and techniques and provide a motivating and helpful environment where researchers/users are trained and supported throughout their projects. Every other year the institutes of the Tübingen campus invite the general public to their Open House or participate in the TÜFF (Tübinger Fenster für Forschung), a science fair. Scientists participate regularly at events like the „Kinder-Uni“ (Children's University), the Maus-Türöffner-Tag (open house event for children), as well as in presentations and podium discussions hosted by the MPI for Developmental Biology, FML or the partner institutes. in the area of Integrative Biology, including evolutionary biology, ecology and higher-order interactions among organisms. Areas of interest include, but are not limited to: host-microbial interactions, new model systems, and integration of biological processes across scales. The successful candidate will be expected to have a strong research profile in these areas, with opportunities for links to ongoing research at the Institute. The Max Planck Institute for Developmental Biology has a general interest in understanding biological complexity at all levels, from single macromolecules to networks of organisms. The Institute addresses these questions using a range of methods, which all focus on the molecular principles of life. Applications, letters of interest, and nominations of candidates should be sent to Dr. Ruth E. Ley, Max Planck Institute for Developmental Biology, Max Planck Ring 5, 72076 Tübingen, Germany (rley(at)tuebingen.mpg.de) by April 15th, 2019. The Max Planck Society for the Advancement of Science is an independent, non-profit research organization that primarily promotes and supports basic research. The Max Planck Society is an equal opportunity employer and is committed to diversity and inclusion in all aspects of recruiting and employment. The Max Planck Society is aiming to increase the percentage of women among its scientific leadership, particularly at the director level. Therefore, we strongly encourage expression of interest from and nominations of qualified female scientists. Our institute conducts basic research on the development and evolution of animals and plants at different organisational levels – from molecules on to the whole organism and up to distinct species. Currently, there are six different research departments each presided by one of the Institute’s directors, as well as several independent research groups, amongst them the active emeritus group of Christiane Nüsslein-Volhard. The International Max Planck Research School (IMPRS) “From Molecules to Organisms” and the International PhD Program in the Biological Sciences. Here you find all the latest information about the Max Planck Campus Tübingen. We send press releases on a regularly base to inform the media and the broad interested audience about the latest research results and topics. Stay informed about what is happening on Campus and the latest public events. The promotion of young scientists is a very important goal at the MPI for Developmental Biology. In close cooperation with the University of Tübingen about 200 students from all over the world are working at the three Max Planck Institutes and at the Friedrich Miescher Laboratory on their theses. as well as pupils and teachers.